I can see why my little sister thought cake would cure anything that ailed a body. My mother was a champion cake-baker back in the 70’s before she had to get serious about cutting out sugar for her health. Most Saturdays would find her frosting a homemade coconut or Italian Creme or carrot cake. We kids would salivate around the kitchen counter in anticipation. We would eat the cake in small slivers, because our theory was that three thin slices had less calories than one thick slice. One of the cakes Mother made frequently was called Wacky Cake (some call it Depression Cake) because the ingredients were always on hand (it does not have any milk, butter or eggs) and you simply stir it up in a bowl (no mixer). You don’t even have to grease the pan. My brother always requested this cake for his birthday with a simple vanilla icing. My husband had out-patient surgery this morning, and after I made him a healthy vegetable stew, I remembered my sister’s advice and decided give him some cake! In searching for vegan-friendly desserts for Mother’s Day this weekend, I remembered Mom’s old stand-by, Wacky Cake. 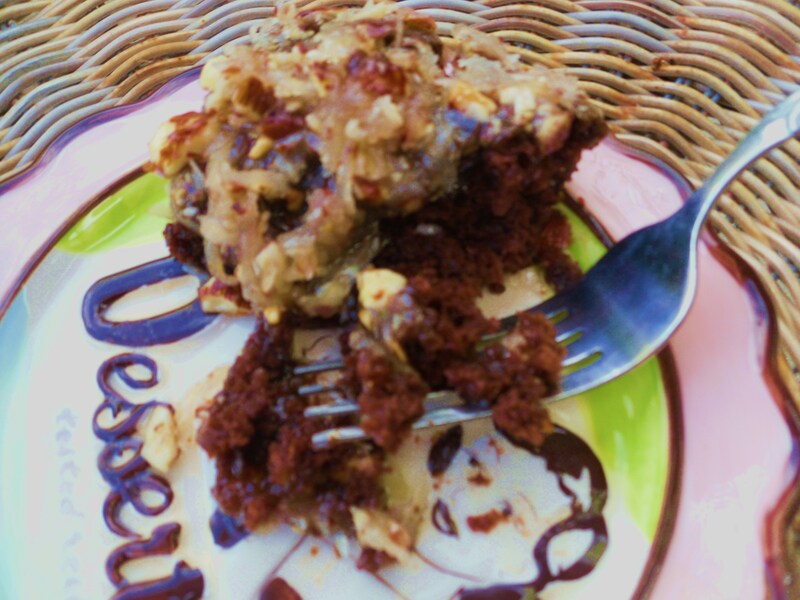 My favorite cake is German Chocolate so I created a vegan-friendly coconut-“butter”-almond frosting for this cake, but used chopped almonds instead, to give it a bit more crunch. Success!! Though I cannot claim that this cake is healthy, it is delicious, and it is vegan. I couldn’t resist eating a piece of it while still warm, moist and falling apart. Heavenly. If you have vegans in your family, or anyone who cannot eat dairy or eggs, this is a wonderful recipe for a special occasion, and both the cake and the frosting are super easy. Bake 35 to 40 minutes, until wooden pick comes out clean. While cake is baking, make frosting below. While cake is warm prick all over with a fork and pour frosting over all. Mix all of the above, except coconut and almonds, together in a saucepan. Bring to boil and while stirring, boil for a full minute. Take off heat. 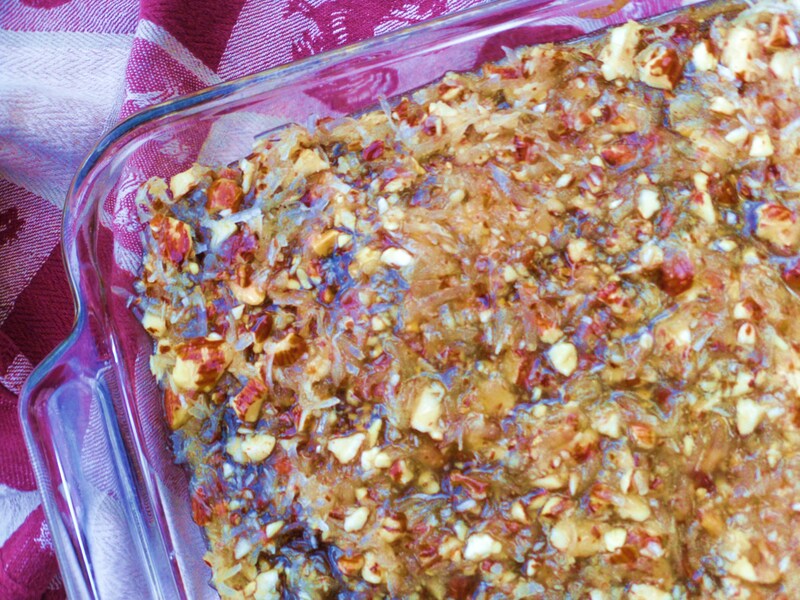 Add coconut and almonds. Pour over cake and spread evenly. Serve warm, room temp or cold! It is delicious anyway you slice and serve it. So yummy! Lucky enough to have this cake brought over when we came home with Penelope, it just took that one slice (or maybe mine and most of Matthew’s) and we were hooked! I make this cake ALL the time, I sometimes skip the nuts and try different toppings, ganache, coconut whipped cream, love it! So glad you enjoyed this Christina… !